The parents of Lucy Holley (1841-1887), wife of George W. Wetherbee and 3rd great-grandmother of MKS, have been found after a most difficult search. George, age 41, and Lucy, age 38, are listed in the 1880 US Census living in Napoleon, Jackson County, Michigan, with two of their children. George, age 13, is then listed in the 1850 US Census living in Grass Lake, Jackson County, Michigan, with his parents and siblings. Well, that is a 30 year gap with nothing to be found in between. Where is George? After reading through thousands of names in the 1850, 1860, and 1870 US Censuses for Napoleon, Grass Lake, and all the surrounding towns in Jackson County, he was, well, right there in Napoleon the entire time. George, age 23, is then listed in the 1860 US Census (page 8, row 18) living in Napoleon, working as a farm laborer for James Holley, Betsy Holley, and family (rows 11-19). Again, his name is mangled (George Weatherly). Now we’re getting somewhere. Are these his in-laws? But there is no daughter Lucy listed. We then find James Hawley in the 1850 US Census with wife Elizabeth Hawley and the same children living in Columbia, Jackson County, Michigan. And there we find Lucy Hawley, age 8. This age is consistent with Lucy’s birth year of 1841 in subsequent US Censuses and other records. And we then hit the jackpot! Betsey Holley’s will and probate records are available online, and list Lucy Weatherby and three of her children (Elmer, Leroy, and Homer Wetherbee). Ancestry.com hints then quickly tell us that Betsey’s maiden name is Case. James Holley (1814-1877) and Elizabeth (Betsy) Case (1815-1887) are 4th great-grandparents of MKS in the Wetherbee branch. George W. Wetherbee (1837-1906) and Lucy Holley (1841-1887) are 3rd great-grandparents of MKS in the Wetherbee branch. 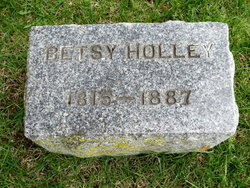 Source: James Holley and Betsy Case Holley tablets, findagrave.com user Vernon W. Goodrich (photographs). Trying to find the maternal parents of a couple in our family tree is almost always more difficult than finding the paternal parents. In the decennial US Census, it is relatively easy to follow the male spouse backward from census to census because his first name (usually) and last name (almost always) stay the same until we find him living with his parents and siblings. However, for the female spouse, we follow the couple back until the first census after they married, and we then do not know where to look in the prior census because her last name (virtually always) changes. Here is a strategy to try with couples who were farmers. Find the male spouse in the census prior to their marriage. This may take a little more work if he left his parents and siblings, and moved to a nearby farm to work for another family—his occupation now listed as farm laborer. 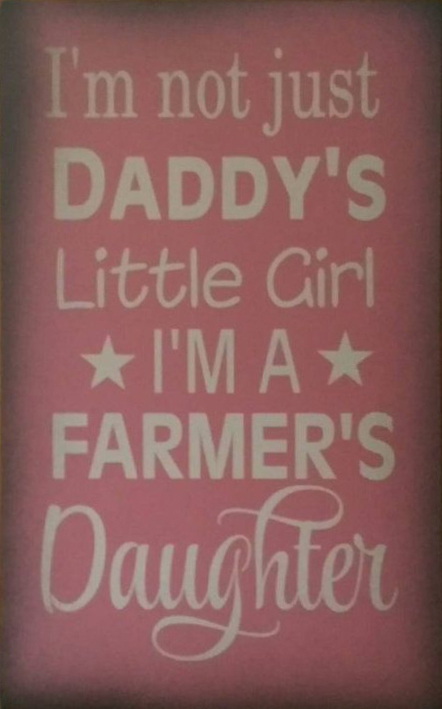 Look at the daughters on the farm. If the female spouse is not there, apply Rule 1: Look Up, Look Down, and look on the nearby farms. Quite often, you will find the female spouse, living with her parents and siblings prior to her marriage. In America, from Colonial times up through the early 1900’s, the farming population represented a majority of the population. So this rule has broad applicability! It is particularly frustrating trying to locate an ancestor in online records when we know exactly where and when to look—like the US Census records for the county we know they lived in—only, they are nowhere to be found. We look again. And again. We pour another cup of coffee, and look again. We invent a story in our head—maybe they were not at home when the census taker came by. We are never going to find them in this record. We talk ourselves into checking the nearby counties. Our ancestors were not necessarily the most literate bunch—public schooling beyond the 8th grade was not widely available until the mid-1900’s. And the DMV was not issuing driver’s licenses yet. When records were created, the person writing the record (also often with limited spelling skills) wrote down phonetically what they heard. Throw in accents, poor handwriting, older handwriting styles, poor record transcriptions, and, yes, even honest mistakes. So get creative. Think like a 9-year-old. How could our ancestor’s name be spelled. When Thomas Jefferson was not busy writing the Declaration of Independence, or the Statute of Virginia for Religious Freedom, he fancied himself an engineer. This is a re-creation of Thomas’ improved design for the moldboard of an agricultural plow, the large, wooden part at the bottom responsible for lifting and turning the sod. Plow with a re-creation of Thomas Jefferson’s Moldboard of Least Resistance . I have imagined and executed a mould-board which may be mathematically demonstrated to be perfect, as far as perfection depends on mathematical principles … it is on the principle of two wedges combined at right angles, the first in the direct line of the furrow to raise the turf gradually, the other across the furrow to turn it over gradually. for both these purposes the wedge is the instrument of the least resistance. I send you the model of the mouldboard of a plough of a form of my own, and ask the favor of you to cast me two dozen in iron. I presume you will preserve the mould, as I shall probably call annually for a supply. I will thank you to have them ready as soon [a]s you can, and I will direct them to be called for. they had better be tied together in manageable bundles by bits of nailrod passing thro’ their holes. mr Gibson will be so good as to pay your bill for them. accept the assurance of my respect. You can read three letters from Thomas to John online at the National Archives. Major John Staples (1773-1828) is 1st cousin 7x removed of MKS in the Spratlin branch. President Thomas Jefferson (1743-1826) is 1st cousin 9x removed of MKS in the Knight branch. Extract from Thomas Jefferson to John Taylor, monticello.org. Correspondence between Jefferson and Staples, monticello.org. 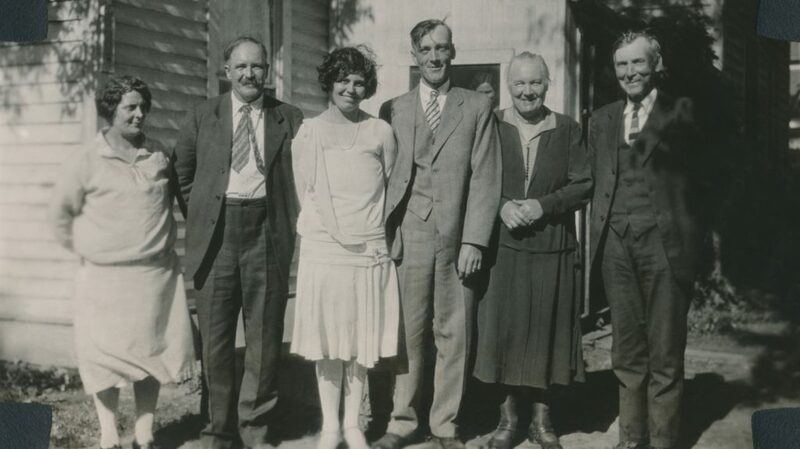 Clifton Porter and Una May Davey wedding portrait with parents, 24 Jun 1928, Portland, Multnomah County, Oregon. George Porter (1865-1942) and Ida Jane Adams (1875-1955) are 2nd great-grandparents of MKS in the Watne branch. Clifton Adams Porter (1898-1972) is 2nd great-uncle of MKS in the Watne branch. Una May Davey (1904-1991) is spouse of 2nd great-uncle Clifton Porter. William Weston Davey (1873-1938) and Louise Marie Rickbeil (1883-1978) are in-laws of 2nd great-uncle Clifton Porter. 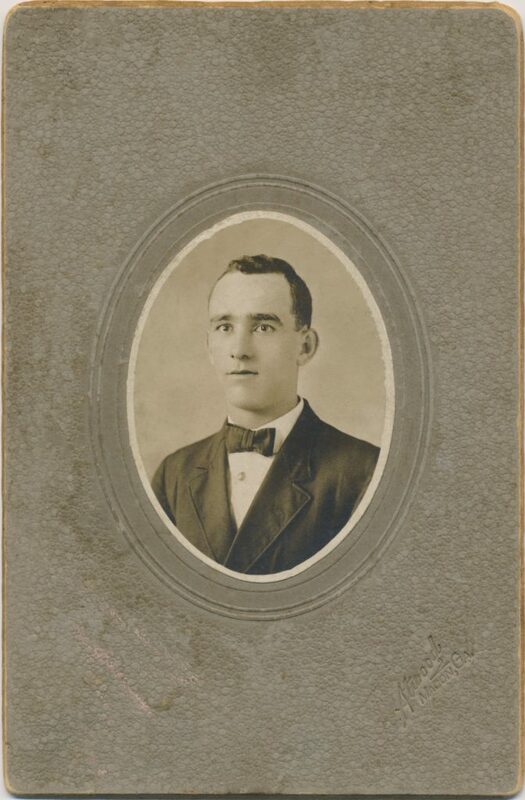 William was born on 22 Sep 1890 in Powellton, Hancock County, Georgia, and grew up in Warren County, Georgia. He married Archie June Williams on 27 Jan 1915 (this portrait was taken around that year) in Union Point, Baldwin County, Georgia, and they resided there until after 1930. They resided in Augusta, Richmond County, Georgia between 1935-1940. His father, Grady, was an engineer with the Georgia Railroad. William and Archie were residing in Greenville, Greenville County, South Carolina when he died on 10 Jun 1947 at the age of 56. His death certificate lists the cause of death as “cardiac failure immediately after induction of anesthesia due to unknown cause.” He is buried at Woodlawn Memorial Park in Greenville. William Grady Chapman (1890-1947) is 2nd great-grandfather of MKS in the Knight branch. 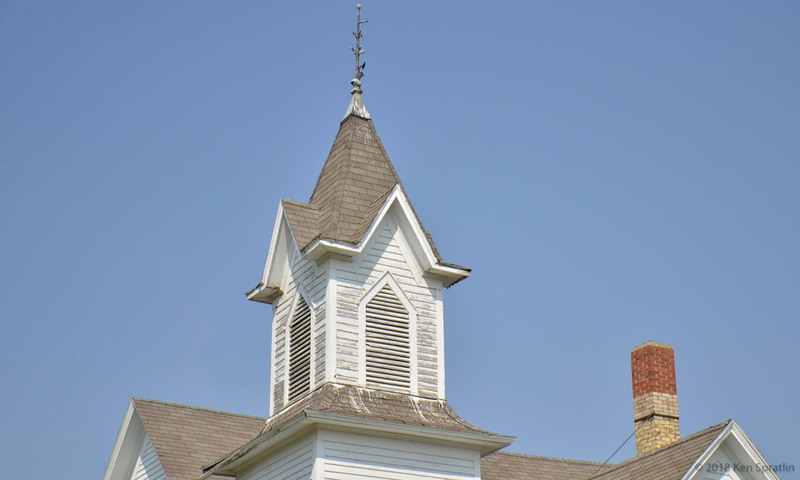 Acknowledgement: This post is based on History of Clarendon from 1810 to 1888  by David Sturges Copeland, published in 1889, and Pullman Architectural News, Summer 2014, Volume 2, No. 2 . The town of Clarendon, Orleans County, New York, figures prominently in the history of our Wetherbee line, and visa versa. John Wetherbee brought his family, including sons Samuel and Henry, to Clarendon by 1821. David and John M. are two of Samuel’s sons. 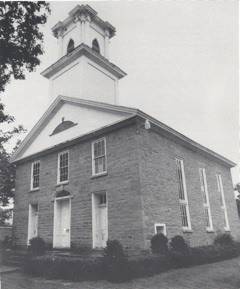 The last regular Universalist service was held in the church in May 1959. Unfortunately, the church building was demolished in the fall of 2006. The Pullman Architectural News  tells the story of the building’s demise. John Wetherbee (1751-1836) is 5th great-grandfather of MKS in the Wetherbee branch. Brothers Samuel Wetherbee (1800-1879) and Henry Wetherbee (1810-1879) are 5th great-uncles of MKS in the Wetherbee branch. Brothers David Wetherbee (1831-1911) and Sergeant John M. Wetherbee (1838-1875) are 1st cousins 5x removed of MKS in the Wetherbee branch. Sergeant John M. Wetherbee was terribly wounded at the Battle of Mine Run in 1863 during the Civil War, and died of his injuries 12 years later. History of Clarendon from 1810 to 1888, David Sturges Copeland, 1889. Pullman Architectural News, Summer 2014, Volume 2, No. 2. Source: Alan Isselhard, Clarendon, NY Town Historian (black and white photograph).